Located on Spall Rd. we offer ice cold beer, friendly service and great food. Originally Opened by Greg Adams, a NHL Player for the Vancouver Canucks, it has been owned by Ron Doig ever since and has truly blossomed into the best "Little" pub in K-town. With it's quaint size and impeccable service it's the place to go to catch the BIG game or catch up with some friends. Cheese Burger Deluxe, Fries & a Pint! Add Any Topping For Just A Buck! Crab cream cheese and peppers lightly breaded & deep fried. Deep fried calamari served with Tzatziki sauce tor dipping. Home made, served with tortilla chips. Baked potato skins filled with bacon. cheese and green onions. Served with sour cream on the side. Succulent scallops wrapped in bacon cooked to perfection with seafood sauce for dipping. Served with garlic toast. Mushroom caps filled with cream cheese, crab and shrimp topped with Parmesan cheese and baked. Served with garlic toast. Potato & Cheddar perogies topped with fried onions and served with sour cream. Spicy cross tracked fries loaded with cheese & green onions. Served with honey mustard for dipping. Boneless dry ribs served with sweet chili sauce. Seasonal fresh vegetables served with ranch dressing. Lightly battered & deep fried Onion Rings served in a basket. Traditional chicken strips served with honey mustard or plum sauce. Tender pieces of chicken breast battered & deep fried to a golden brown with fries & salad. Served with honey mustard dip. Cheesy sticks deep-tried and served with salsa for dipping. Hot, Honey Garlic, Teriyaki, Sweet Chili, BBQ, Lemon Pepper, Cajun or Dry Salted. 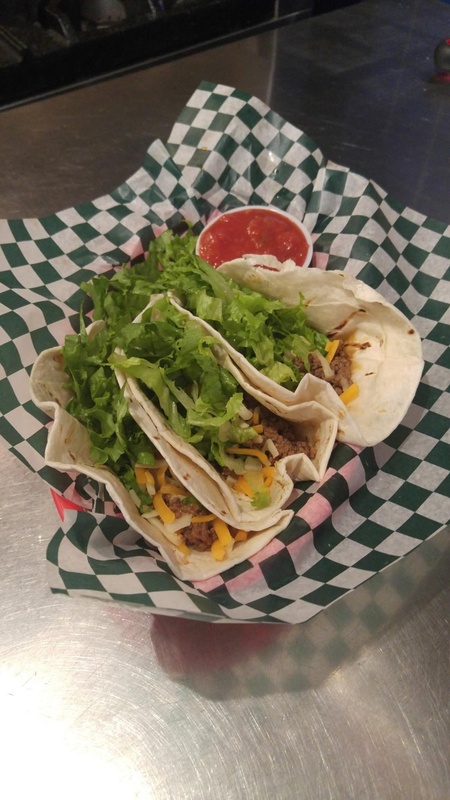 Three soft shell tacos with spicy beef, cheese & lettuce, served with salsa. Tortilla chips loaded with nacho cheese black olives sweet rred & green peppers, jalapenos served with salsa and sour cream. Crab poppers, mozzarella sticks, onion rings, battered zucchini & mushrooms. Served with Cajun sauce & ranch dip. Wholesome, hearty, and always Delicious! Monday - Friday, changes daily. Your choice of chicken or crispy pork bites, sauteed with peppers, onions, celery, carrots and pineapple tossed together with tender noodles. Zesty home made meat sauce tossed in spaghetti and topped with Asiago cheese, served with garlic toast. Potato & cheddar perogies smothered with sauteed ham & onions, with a smokie and tossed salad. Sauteed veggies. black olives. jalapenos & melted cheese on a fresh flour tortilla Served with sour cream & salsa. Baxter's homemade Caesar dressing mixed with fresh romaine, croutons and Parmesan cheese. Served with garlic toast. Battered & deep fried Cod with salad, fries, tartar sauce & a lemon wedge. A delicious combination of crisp greens topped with julienne of ham, turkey & cheese. Crowned with hard boiled egg, tomato wedges and cucumber. Served with garlic toast. A medley of peppers, onions, tomato, & cucumber with chunks of feta & whole black olives, tossed in our own dressing. Served with pita bread. Crab. baby shrimp. avocado, almond slivers & a hard boiled egg, over fresh mixed salad with balsamic vinegar dressing. Served with garlic toast. All Burgers, Wraps & Sandwiches served with your choice of Caesar salad, tossed salad or fries. Charbroiled patty loaded with mushrooms, bacon, BBQ sauce & cheddar cheese, Served on a fresh bun with lettuce, tomato, onion & a pickle. Crispy chicken breast, tossed in hot sauce and topped with Swiss cheese. Served on a grilled bun with lettuce and tomato. Charbroiled patty topped with crisp bacon and cheddar served on a fresh bun with lettuce, tomato, onion & a pickle. 6 oz. chicken breast smothered with mushrooms & Swiss cheese served on a fresh bun. New York steak grilled your way, served on garlic toast, with fries and a Caesar salad. Our freshly made burger without the bun! Smothered in sauteed mushrooms and onions, topped with gravy, and served with fries. Grilled chicken breast topped with guacamole & Swiss cheese, Served on a fresh bun with mayo, tomato & lettuce. Vegetable burger served on a fresh bun with tomato, lettuce & mayo. Our classic triple decker with slices of turkey, bacon, cheese, lettuce & tomato. Grilled to perfection & loaded with cheese. Mouth watering roast beef, stacked with lettuce, tomato, cheese & horseradish mayo. Turkey breast, crisp lettuce & Swiss cheese on whole wheat bread. Mouth watering thin slices of roast beet. onion rings & melted Swiss cheese. Served on a grilled bun with Aus Jus for dipping. Avocado, cucumber, tomato, lettuce, red onion with Swiss cheese & cream cheese. Crispy bacon, lettuce, tomato & cheddar cheese on whole wheat bread. Sliced chicken fingers with lettuce & tomato in a fresh flour tortilla. Spicy beef or chicken with cheese, lettuce, peppers & onions. Turkey, bacon, lettuce, tomato & cheese mixed with our own ranch dressing in a fresh flour tortilla. Chicken, tomato and cucumbers tossed in Greek dressing and topped with feta cheese, wrapped up in a warm fresh pita. Sliced chicken, ham, salsa, cheese, pineapple, rice, lettuce & mayo wrapped in a fresh flour tortilla. Crab meat, shrimp, cucumbers. avocado, tomato & mixed lettuce tossed in a creamy dill dressing. Ask us to spice it up a bit for a real Zing!